From time to time I manage to get a hold of fabric in some rare patterns. 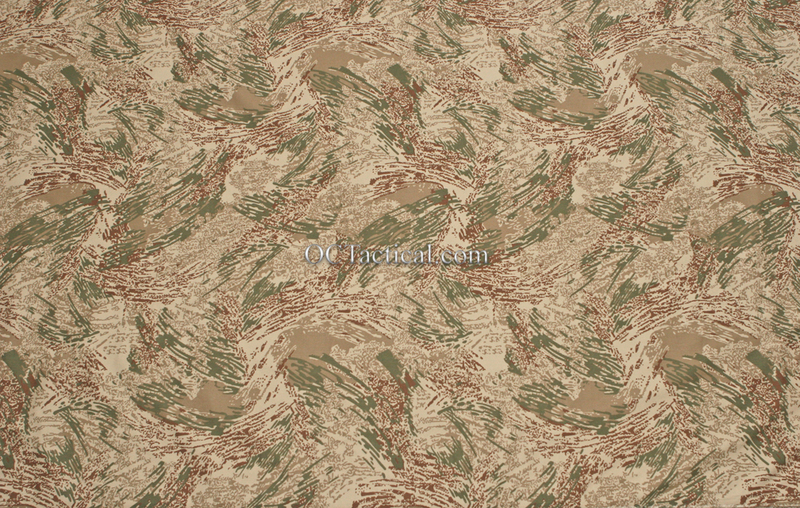 One pattern that has always eluded me has been the Army trial pattern, Desert Brush. I finally lucked out and was able to get hold of a small quantity. 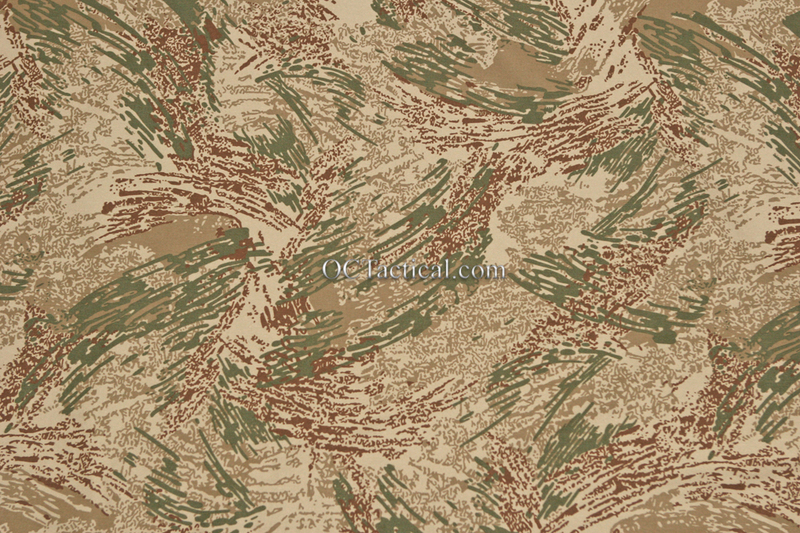 Desert Brush was part of the Natick camo trials to find a universal camouflage for the Army. In the end Desert Brush was the overall winner. However for some reason it was tossed aside and the decision was made to go with the current UCP instead, which wasn’t even part of the trials. After finally seeing this pattern in person I can’t understand how anyone could believe UCP would be a more effective camouflage for multiple environments then Desert Brush. Up till now I’ve never seen a good photo showing the pattern so I thought I’d share. I also included a shot of Urban Track, which was part of the same Natick trials. I’ve read that the colors for the current UCP were taken from the Urban Track pattern. Before you ask, the fabric is NOT for sale and I WILL NOT be making gear in the pattern. 18 Responses to Desert Brush, the Camo That Should Have Been. What a crazy looking pattern. Looks similar in pattern to some of the vietnam era tigerstripes with the colors of tropentarn. How big is the scale of the pattern? 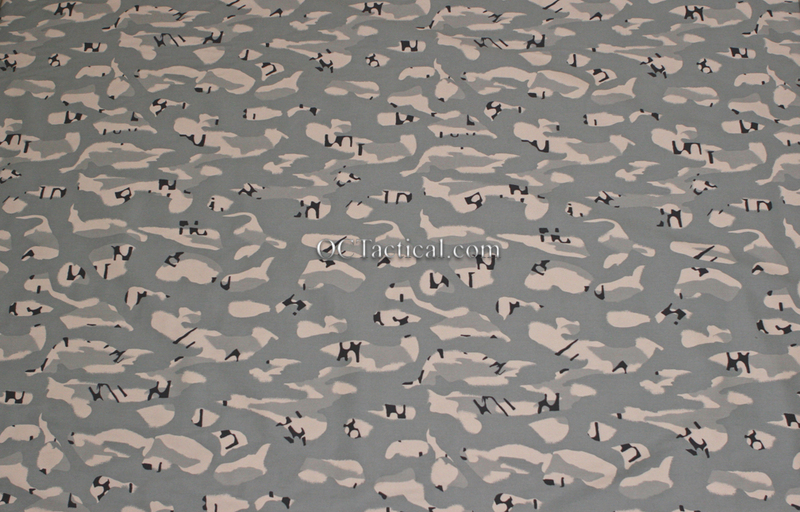 Is the frist pic of the whole width of the fabric? You always seem to find the sweet finds! Like the ‘American Pickers’ of fabric. I’ll have to take another photo next to something else for a size comparison. Someone else called me the wikileaks of camo after all the different DG3 patterns I managed to find. The pattern repeat is too small on both of those – so they wouldn’t have really been that great. The colors of the Desert Brush pattern are nice though. Urban Track on the other hand looks like a botched abortion. Have you ever seen it in person or in the field? Yes. DB is okay on a uniform where the pattern gets broken up by packs, pouches, etc. but it wouldn’t be o great as a basha or something where you use a larger section of it, becuase the pattern repeat would be relatively easy to see. I here what you’re saying and that would be true if it were in the open all by itself, but that would be the case with just about any pattern. In that type of scenario as a shelter or for making a hide site it would be mostly overhead cover and you wouldn’t really see it till you were up on it or viewing from elevation. But that’s were basic soldiering comes in. You still need to use the terrain and natural camouflage from the surrounding area to conceal the position effectively. That being said this pattern is still only going to be effective in certain areas so in the end they still would have run into similar problems like they currently have with UCP, but overall it would have been a much better choice. I agree on your vision of the pattern being better than ucp. I saw some material out of New Zealand that was quite nice. If I come across some pics of it again I’ll send them your way. I think they didn’t adopt this pattern because it slightly resembles some very old patterns that were also referred to as brush patterns eg. the very first british patterns or the south african/african brush patterns and hence was viewed to be outdated.great shame.However I believe UCP has a future but I think its a neat idea so I’m not telling everyone what I have in mind. from pictures I’ve seen the urban track pattern seen here was to be vertically orientated not landscape like this is shown. You’re correct, that’s just the way I took the photo. You’ve got some amazing patterns mate. I liked the track pattern that had similar colours as the brush pattern, ie brown track shapes not black, semi arid colours. That was the Desert Track. I’ve seen that fabric pop up once for sale, but I was to slow and didn’t get any. I believe Desert Brush looked too much like the Russian Green Reed Pattern http://www.tridentmilitary.com/New-Photos9/r19b.jpg and was scrapped. I don’t think we will ever know the really reason it was scrapped for ucp. Fantastic find. I’ve always seen this pattern mentioned in studies, but have never seen a clear shot of the pattern before. What really boggles my mind, is the only reason UCP was chosen for the ACU was the fact that it was digital. The Army needed to be on par with MARPAT. However, why couldn’t the Desert Brush have been digitized? Even if it was less effective than the original pattern, I’m sure it would still out perform UCP.